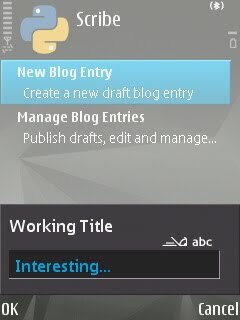 currently available in beta for Symbian 3rd Edition devices. Not on Jaiku? Need an invite? Scribe™ allows you to create, edit, and publish entries on your WordPress-powered blog from anywhere, using just your mobile handset. Check out an initial review and some screenshots here. You'll then find Scribe™ in your Applications folder! The first time you run Scribe™ it will ask for your blog settings. Scribe™ is very new, so please stop by the #scribe Jaiku channel to keep updated and give me some feedback! If you don't have a Jaiku invite, you can get one at Jaiku Invites. Scribe™ was designed and developed by Jay Fenton and is (c) 2008. All rights reserved.